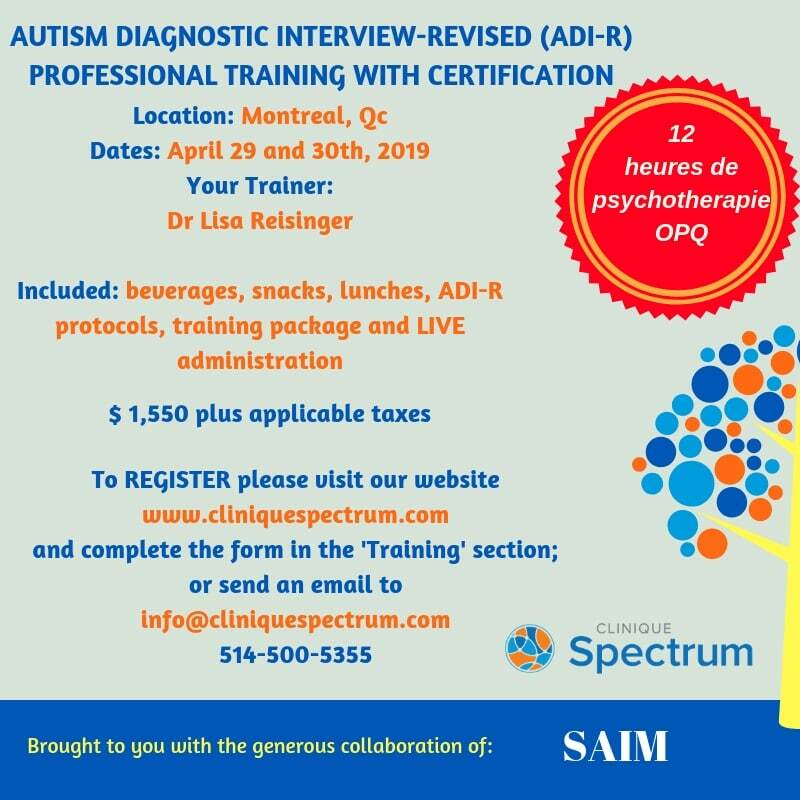 Participants who wish to perfect their skills in the assessment of autism spectrum disorder using the ADI-R can join us for our in-depth training workshop. This training provides professionals with the opportunity to work towards research & clinical reliability. Professionals and Graduate students with considerable experience working with individuals with ASD and who will be participating in ASD diagnostic assessment for clinical or research purposes. A clinical professional aiding in the diagnostic process. A certificate of completion of training will be offered upon successful completion of the course. Dr. Lisa Reisinger is a developmental psychologist who has experience working with people with autism for over 20 years. She is a certified ADOS-2 and ADI-R independent Trainer through both the STAR Centre, University of California at San Francisco and the Centre for Autism and the Developing Brain at the Weill-Cornell Medical Centre. She is a leading clinician in the differential diagnosis of autism and its related populations. She has many years of experience as a university lecturer (McGill University) and she has written several peer reviewed scientific journal articles and book chapters. Registered participants will be emailed the agenda for the training workshop, prior to the commencement of the course. Please be familiar with the ADI-R manual prior to coming to the training. Please bring your ADI-R manual with you to the training course. Manuals can be purchased at MHS or WPS or in Québec at IRP. Registration fees will be reimbursed in full minus a $50 administrative fee, up to 15 days before the event. There is no reimbursement for cancellations 15 days or less before the event. Clinique Spectrum reserves the right to cancel a workshop/training program if there is insufficient registration. 2 blocks from Charlevoix metro (green line), 10 minutes from Atwater Market, parking available, the building is located along the lovely Lachine Canal bike path.